I don’t remember the first time I had asparagus. It wasn’t something I was served as a child but once I got older, I must have decided to try it at some point because ever since then, I have anxiously awaited the arrival of asparagus season. I watch and watch the displays at Loblaws every time I go there until I see the local Canadian grown asparagus and then buy it every single week for as long as it’s available. Every month, Loblaws has Monthly Food Alerts on items that are only available for a limited time. It’s a great way to keep up to date on what’s available that month and make the most of seasonal cooking! 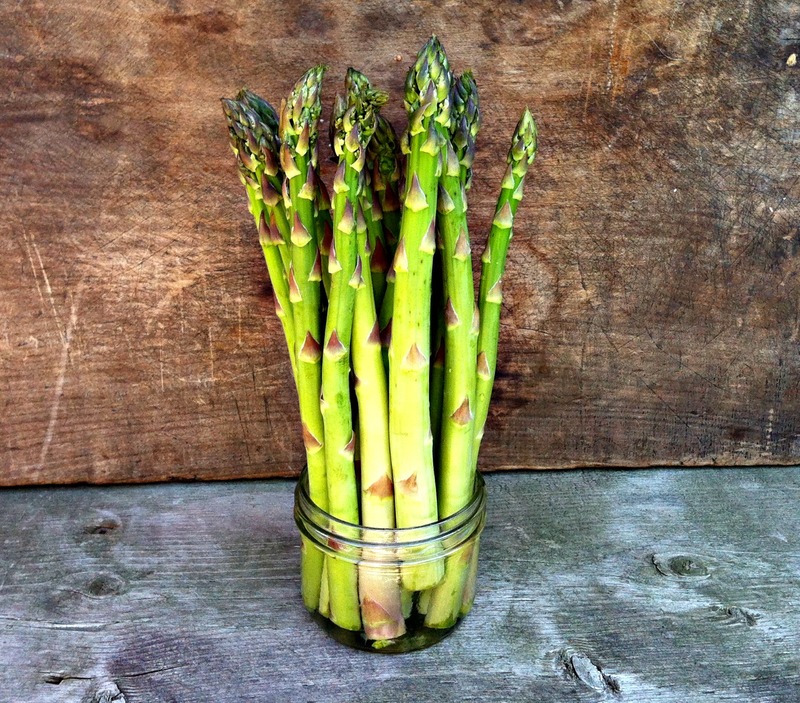 This month, the Monthly Food Alert item is my beloved asparagus. Asparagus is low in calories, a good source of dietary fiber, and full of nutrients, including calcium, magnesium, zinc, and many more. It’s versatile and can be prepared in a variety of ways including roasting, grilling, poaching, and pickling. 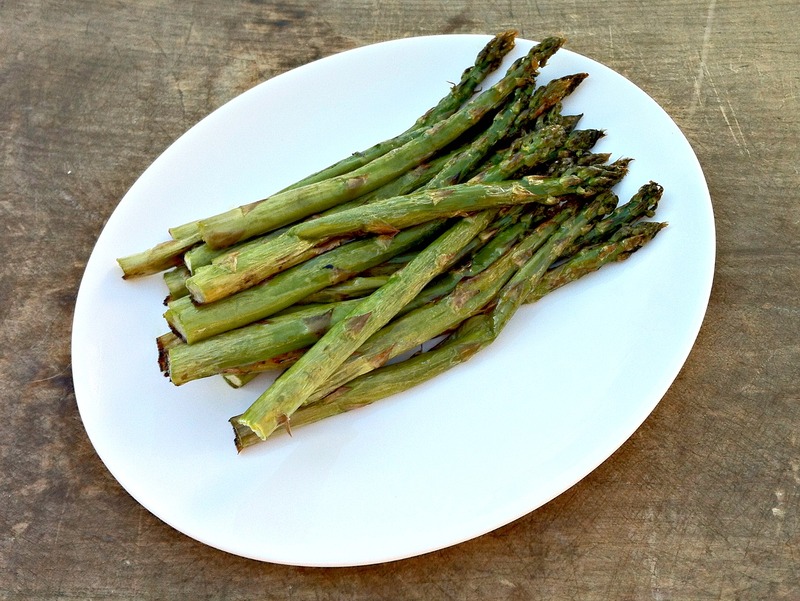 I have amassed a collection of asparagus recipes and every single one of them I’ve tried is delicious but these two are my favourites…at least so far. Prepping asparagus is really simple. Cut off the ends and any woody parts of the stems. Wash under cold running water. It likes to be kept in a cool and damp environment, so I’ve found the best way to store it is by placing it upright in a jar with about an inch of water in it. Cover loosely with a plastic bag. 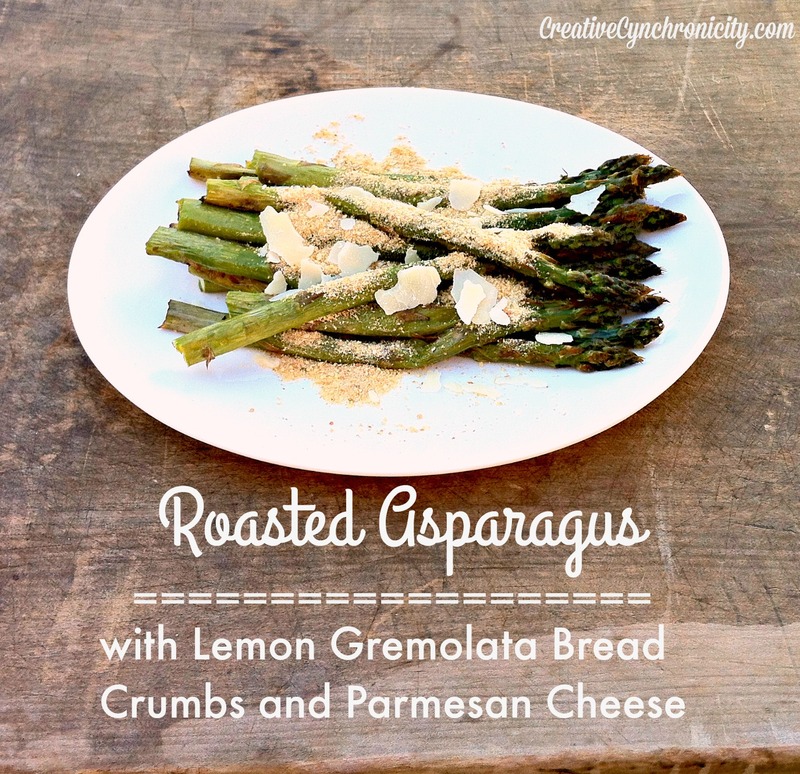 Roasting asparagus is SO easy. Drizzle it with a bit of olive oil and toss until lightly coated. Place on a baking sheet (I like to use non-stick aluminum foil on it) and roast in a 400 degree F oven for about 20 minutes. Let me tell you, it doesn’t need any more preparation than that. it’s delicious just as is. But if you’re like me and consuming asparagus a couple times a week, you might want to change it up a bit. A little squeeze of lemon juice or some Parmesan can be a nice addition. Or make my lemon Gremolata breadcrumbs and sprinkle those over top once they come out of the oven (with or without some Parmesan). Toss 1/2 cup bread crumbs or Panko with 1 tsp olive oil, 1 tsp. lemon zest, 1 garlic clove (minced), salt and pepper to taste. Toss in a skillet over medium heat for about 2 minutes. You can add some parsley or Italian seasoning after it comes out of the skillet if you’d like. That’s it. Easy peasy! And it’s great on other green vegetables, pasta, fish, and chicken too. You can store it in the freezer for up to 6 months. This recipe is based on my bacon wrapped green beans recipe. These amounts are for one bunch of asparagus. Divide it into bundles of 3-4 stalks each and wrap each bundle in a piece of bacon. (It took about half a package of bacon for one bunch of asparagus). I find the bacon cooks more thoroughly if it doesn’t overlap on itself. Place the bundles on a baking sheet or in a roasting pan. I find it best to line it with non-stick aluminum foil or to spray it with non-stick cooking spray. In a saucepan, simply mix together 1/2 cup butter, 1/4 cup brown sugar, 1/4 tsp. garlic powder, and 1/4 tsp. soy sauce in a saucepan over low to medium heat. Once melted, brush this mixture over each bundle until each one is coated with the glaze. 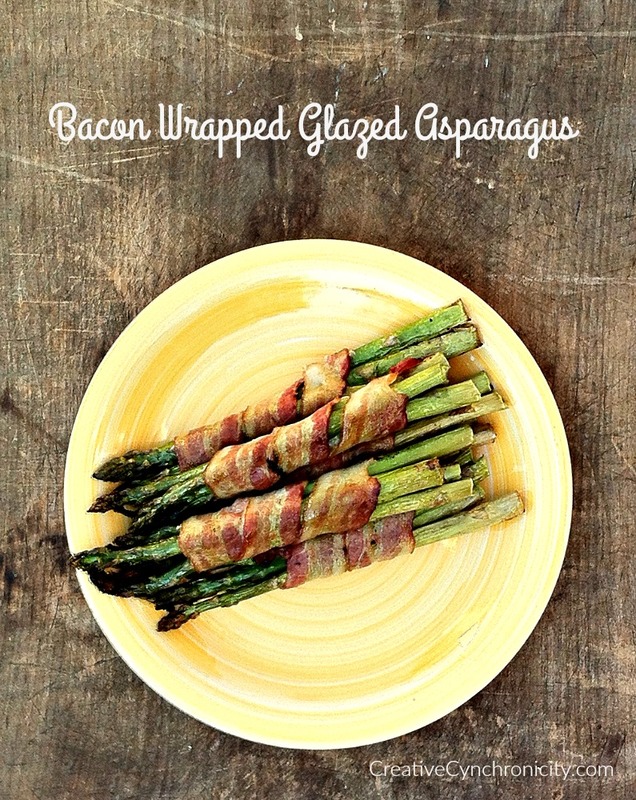 Place in a 400 degree F oven for 20-25 minutes, until the asparagus and bacon are cooked. To encourage you to try out these Monthly Food Alert items, Loblaws is giving you a chance to enter to win up to $250 in groceries free! Make sure your own Instagram account is set to “public”. You need to enter right away because this month’s contest ends on June 30th. Contest is open to legal residents of Canada who live in Ontario.